This is one of those books which make you raise your game when it comes to thinking about music in general, and the string quartets of Shostakovich in particular. Sarah Reichardt is an Assistant Professor of Music at the University of Oklahoma, and with this book she presents an in-depth analysis of the quartets nos. 6, 7, 8 and 9. Although this might seem to be a restricted selection, in fact it allows Reichardt to focus on as many of the significant aspects of Shostakovich’s entire output for the medium. These four middle quartets make up an entirely satisfying set, with the 9th quartet leaning on structural elements of those preceding. The breadth of expression covered by these four works also pretty much covers the emotional and technical spectrum of the entire canon of the quartets, and I have found myself listening to the pieces not included in the book in a way which is coloured by many of the references and analyses made here. Solomon Volkov’s memoirs of Dmitri Shostakovich are mentioned in the blurb to this book, and part of the aim of Reichardt’s analyses and comment is to set aside a biographically grounded approach and avoid the controversy this has caused over the years. In doing this, she does however lay down a potential bed of nails – we may appreciate this different angle, but are posed with numerous points on which agreement or disagreement will undoubtedly create their own level of argument. This stimulation of discussion is no bad thing of course, but as I learned in the dim and distant days of my own education in this field, it is almost never correct to take anything for granted. As a general comment, this book is not a particularly easy read. My own experience of musical analysis is now clearly hopelessly out of date, since the language used by Reichardt had me flicking towards the end in search of a glossary almost straight away. I am by no means suggesting that such writers should ‘dumb down’ and am more than willing to put up my own hand in pleading appalling ignorance. Being sent scurrying to look up words like ‘hermeneutic’ and ‘epistime’ however, and swallowing sentences such as ‘The idea of an ungraspable entity that affects discourse is one elucidated by the Lacanian psychoanalytical concept of the “real.”’, may give readers some idea of the kind of intellectual hoops one is asked to negotiate. To be fair, Reichardt fully explains each of her analytical bases, and working through and comprehending each argument is both educational and rewarding in terms of an appreciation of the quartets. It does however mean that ‘dipping’ into the book and expecting to glean little nuggets of information which you can slip casually into your next music appreciation meeting are pretty much out. Unless you are uncommonly well informed on the subject, you will need to prepare the foundations for each analysis by reading in much the same way the author did when writing the book. With this mapped out as a viewpoint for the entire quartet, the work is seen in terms of Death, as ceremonial, in terms of the physical actions of a Dance or a March, and as a Funeral Lament. While five chapters with the words ‘death’ or ‘funeral’ in the title might seem a bit doom-laden and one sided, Reichardt provides convincing arguments for all of these aspects of the work using extensive references both musical and as sourced from other comments both literary and analytical. These references are both specific to the work and incidental in terms of the philosophy and external themes applied to the discussion. Reduced to a nutshell, the Sixth String Quartet is analysed in terms of endings: ‘Cadences and Closure’, the importance of the coda is an important element in Rechardt’s approach to the Seventh, and the Ninth is viewed in terms of ‘Novelization’, showing how it builds on the previous quartets to create its own narrative. The full title of each chapter give some clues: The end that is no end: cadences and closure in the 6th string quartet, Op.101 (1956); The space between: codas, death and the 7th string quartet, Op108 (1960); Musical hauntings: the ritual of conjuration in Shostakovich's 8th string quartet, Op.110 (1960); The indivisible remainder: novelization in the 9th string quartet, Op.117 (1964). While stimulated, but also somewhat staggered by all of this bracing and breathtaking intellectual discourse, I always had a no doubt naïve thought nagging at the back of my mind. As a composer, I know something about the personal symbolism of certain ‘moments’ in music. These have a certain fixed character, but only in terms of time. They will have a particular meaning when the music is discovered and written, but will adapt and change as the life of the composer and that of the piece itself proceeds and is altered by time. For me it is almost impossible to take an objective view and apply retrospective symbolic analysis to any of my own pieces, so I therefore also find it problematic when applying it to other composers or specific works. 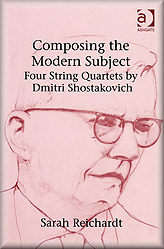 It is certainly educational to find out about the spider’s web of thematic reference and relationships which go towards creating the consistently enigmatic world of Shostakovich’s string quartets, but without the clearly impossible added equation of the composer’s own answers to these questions, we can only apply external interpretation and use best evidence to back up our viewpoint. This Reichardt does superlatively well, and I’m not suggesting that she is imposing a fait accompli on this or any of the other quartets, but I would defend to the death anyone capable of finding and supporting an argument for the Eighth String Quartet as an affirmation of life. No, I’m not saying it would be correct, I’m just saying that one’s own feelings and views shouldn’t necessarily be discounted as invalid when set against the strength of any analysis, however forceful and convincing its argument. This detailed and fascinating exploration of the musical ambiguities of these string quartets turns out to be one of those books which you will want to take with you on holiday. Equipped with recordings and a restful environment, you’ll appreciate the kind of time and space with which to immerse yourself in Reichardt’s intense and demanding, but ultimately highly rewarding world. There are plenty of score fragments illustrating the most important musical events, but having a complete study score to hand always helps – not so much in terms of the content of the book, but so you can identify for yourself the re-appearance and transformation of ideas already illustrated. 129 pages may not seem like much, especially when many of those are taken up with indexes, references, musical quotes and bibliography, but don’t be fooled – the type is quite small, and there is more than enough to get your mental teeth into. Reichardt’s research and writing not only confronts us with elements in the music which reveal the constant flux of the ‘modern subject’ in Shostakovich, but also reflects pathologies endemic to the modern condition through the application of psychoanalysis. Knowledge is strength, and even if it becomes the cause of debate either internal or in company, it can still only strengthen our appreciation of these incredible pieces.